ABSTRACT: Guoxue as an idea and intellectual pursuit has a history of roughly a century in China. From its origins in the last decade of the Qing dynasty (1644-1911), it has been integral to the search for a past that is appropriate to the formation of China as a nation. At the same time, its constitution over time has varied with changing conceptions of the nation, as well as its place in the world. Interest in guoxue declined during the height of the revolution, from the 1940s through the 1960s, but has enjoyed resurgence since the 1990s among scholars and the general public alike. This time around, it expresses a newfound pride in the past that has accompanied success in development, as well as an urge to bring inherited cultural legacies and modes of scholarship into a global dialogue on culture. While very much rooted in the history of modern China, it also parallels in this new phase a reassertion globally of traditions suppressed under the regime of Euromodernity. Its content remains vague, however, and subject to contention from different ideological perspectives. ABSTRACT : After some opening remarks on the recent commodification of guoxue, I first trace the rise of guoxue in the contemporary period, and then I examine two topics in more detail: guoxue’s historical and contemporary transformation into an academic discipline; and the immediate origins of guoxue’s pronounced ethnoepistemological character. Through this examination my aim is to bring into greater relief some of the aspirations invested in guoxue by its contemporary protagonists, and also to highlight some of the conundrums associated with those aspirations. ABSTRACT: This essay is a critical reaction to the movement for the revival and constitution of guoxue (national learning), not just as a system of indigenous knowledge and scholarship, but also as an embodiment of Chinese national culture. Situating the conceptualisation of guoxue in the context of the May Fourth new cultural movement, the essay attempts to show: a) that guoxue is a category devoid of substance, not least because its classificatory scope cannot be adequately defined, b) that guoxue was invented in the early twentieth century in response to the pressures created by the influx of Western learning that had begun to unsettle and displace forms of classical learning, and c) that the idea of guoxue is rooted in the conviction of the singularity of national culture. Historically, guoxue has opposed such national projects as national language and national literature. 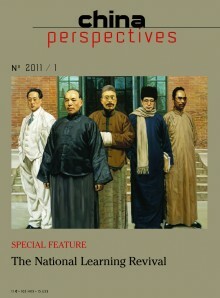 Revisiting a selection of representative views of progressive May Fourth and communist intellectuals on the need to develop and construct a new national language and literature for China’s modernisation, the essay argues for the need to develop a historical understanding of the process in which classical learning has been displaced and to recognise the importance of this process for the development of China’s intellectual modernity. ABSTRACT: This essay addresses the symbolic or socio-ideological significance of what is called guoxue re in China today. In the author’s view, as a concept with a fixed morphological form, guoxue has been traversing history with a changing content, and for different people or social groups it means different things and serves different interests. The catachrestically used term guoxue acquires an imploding ambiguity when it is manipulated to accommodate different needs and desires in the contemporary Chinese culture and commodity market. The kaleidoscopic vertiginous guoxue landscape in China, the essay argues, ultimately points to an unmistakable collusion among the state government, the academic elite, and the commodity market. As such, the imploding ambiguity of the concept and discourse of guoxue bears a continuity with the ambiguity of Chinese modernity, which at present is a conglomerate of capitalism, Marxism, Confucianism, economism or developmentalism, and harmonious society. Moreover, the contemporary guoxue re betrays an innermost desire in the Chinese national unconscious for a different genuinely existing social order, and for other ways of being human than those defined by capitalist modernity while China is being dominated by the rule of capital. ABSTRACT: Taking as a starting-point a qualitative survey carried out between June and November 2007 in an old migrant quarter that was in the process of being demolished, men and women aged between 17 and 82 were questioned in-depth on their life histories, with particular attention paid to their relationship to work. The aim of the research was initially to raise the issue of lines of segmentation and social and geographical – even ethnic – inequalities in relation to employment from a gender perspective. It emerges that the difference between men and women alone cannot explain inequalities in success and integration. A generational approach centred on the women interviewed enabled us to shed light on individual trajectories within a wider historical context, sometimes refuting certain preconceived ideas on such or such a period in history, which though bloody or violent overall, paradoxically had emancipating and integrating effects in terms of employment for certain migrant women.